Let's talk about survival for a moment, shall we? It's always amazing how some people survive dire situations while many others don't. What makes that crucial difference? It's especially fascinating to me how it's usually smaller decisions that are the turning point, the key between life and death. The book I've read most recently on this topic delves into all of these issues. 5 stars: Let's talk about it! 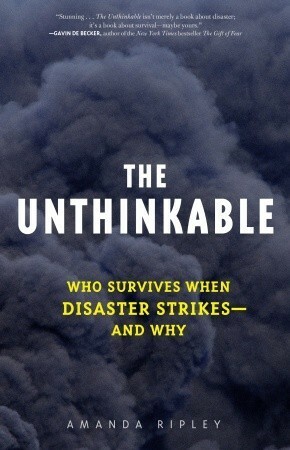 When disaster strikes, people act in all sorts of unpredictable ways. Some people respond by freezing up, some immediately take action (for better or worse), and some dither and can't decide what to do until impending events take away all choice. Worse still, no-one can be sure how they personally will respond, until they have been in a situation like that. Ripley has studied people's responses to all sorts of big disasters; from the 9/11, to hostage situations, to the plane that went down in the Hudson river. 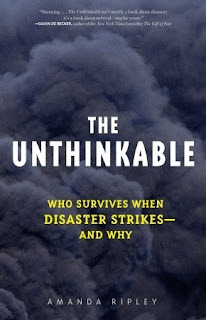 She has also interviewed many experts from a variety of fields on not only what people do in times of crisis, but how to increase any one person's chance for survival. She found that we all go through 3 stages, when faced with a disaster: denial, deliberation, and the decisive moment. Those are the three parts of the book. The chapters within each part delve further into each stage of our response, from delay and procrastination (Denial) to groupthink (Deliberation) to heroism (the Decisive Moment.) There's more; that's just a sampling. This book was fascinating. I have talked it over with several other people since reading it. The topics lead to great discussions naturally. How do we assess risk, and are our assessment tools accurate? (Hint: watching the news doesn't help on this one!) How can we shorten the amount of time we spend in denial and deliberation, so that we move straight to action and keep ourselves alive? How do you think you would react in any of these situations? 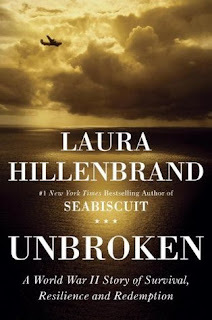 It was chock-full of stories from survivors of disastrous events, as well as some stories of those who didn't make it. Though it may seem like a depressing or anxiety-producing book to read, I found that it was actually the opposite. Reading this helped put some of my personal risk in perspective, as well as gave me tools to prepare myself for these types of events. One of the biggest takeaways for me was from her section on risk. You can't live your life in fear. So you take a rational, clear-eyed look at what disasters you are most likely to experience, then you prepare for those things. In my area, it's probably wildfires and earthquakes. Possibly flooding from the river. A distant fourth would be flooding from the dam breaking up at the reservoir. Okay; knowing that, would do I need to do to prepare my family for those things? You make a plan and you practice it. Even if every detail of your plan doesn't work out--which it probably won't--you stand a much better chance at surviving than those with no plan at all, who have never even considered the possibility. On a very personal note, I actually read this one the weekend before we had the fire in our home. I stayed awake half the night thinking about what I would do if our home caught on fire. How would we get the kids out? What if it happened at night while we were all asleep on the 2nd floor of our home? I remember thinking--it's the middle of winter; we would need to somehow grab shoes and coats if we could. It's a good thing I did, since just 3 days later I had a chance to use the planning and deliberating I had done. The wall behind our boiler caught fire when it was just me home with the kids. (Full story here.) Thankfully, we were not asleep and not trapped upstairs. As I picked up the baby and called 911, I remember grabbing jackets on my way out and making sure the kids had shoes on. It was 15 degrees that night. I want to read this one with a book club so I can discuss it more. So many more interesting things I could tell you, but this review is already getting lengthy. Apparently I'm drawn to this type of story, because I pulled up numerous examples from my reading past to share with you today. Of course, there's this one about the Donner Party expedition, that I reviewed at the end of February. They had good times and bad, but eventually, times went from bad to miserable. After a year in, the supply ship sent to relieve them couldn't make it due to ice blockage. Game was scarce. Their food supply about the same. 3 of the men headed off across the ice pack, hoping to reach Siberia and eventually Alaska, to get help. The 4th man was too sick to travel. 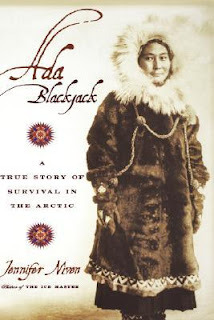 Ada stayed behind with him and eventually was left alone on the island. This is the whole story, starting from the beginnings of the expedition to the end and the aftermath. Niven's portrayal of Ada was even-handed, not glossing over the less savory parts of her story, while still showing her resilience and courage in the face of great adversity. I don't know if I'm getting less adventurous as I go, or if I'm just seeing my true self more clearly as time goes on. In any case, when it comes to Wrangell Island, I'm more than happy to be simply an armchair traveler. 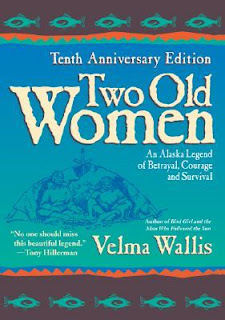 It was a time of starvation and the two old women ate more than they were able to contribute. So the tribe left them behind and moved on. 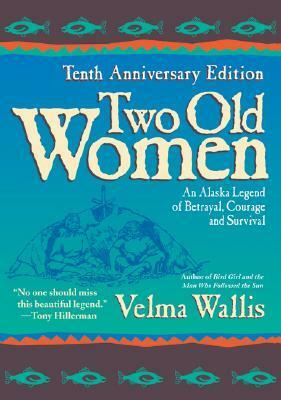 They didn't count on the will to survive and the latent knowledge that the two old women possessed between them. Though old bones creaked and old muscles tired quickly, the women made their way to a place where game could be found, and somehow...survived. Based on an Athabascan legend. This story fascinated me. I loved reading the details of Arctic survival, and how the old women refused to let each other give up, until they made it. The account of the reconciliation with the tribe was also meaningful. A quick read, but well worth your time. Louie Zamperini was at the peak of his form as a runner when the war began. Many predicted he would be the man to break the 4-minute mile. But instead of training for the next Olympics, he began training to be a bombadier in the belly of a B-24 fighter plane. As his flying group completed missions, more and more of his friends didn't come back. Then one day it was him going down into the unforgiving Pacific. His story of surviving the plane crash and subsequent raft journey on the ocean is riveting. Then he and the pilot are finally rescued, but delivered to a worse fate: POW camp. They come to miss the days on the raft. This story follows Zamperini and a few others all the way through the horrors and hardship of POW camps, into later life and how their experiences affected them. I have been wanting to read this one for some time, but when I finally got the chance I had already moved on from my "war books" phase, so it was with reluctance that I went back. It was well worth my time. Hillenbrand keeps the narrative flowing, adding in pieces of information as needed to fill in the gaps. Highly recommended. Do you have what it takes to survive a crisis situation? Maybe you should read some of these books and try to find out!